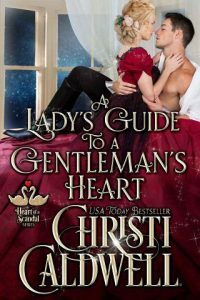 Christi Caldwell’s brand-new Regency book, “A Lady’s Guide to a Gentleman’s Heart” is sure to fill your heart with cheer and warmth this winter season! Don’t miss out on the long-awaited second book in The Heart of a Scandal series!! Honor demands he give her up- Heath Whitworth, Marquess of Mulgrave and heir to a dukedom, is honorable to his handsome bones. When his mother insists he spend the holidays dancing attendance on Lady Emilia Aberdeen, he has no choice but to do the gentlemanly thing. For years, Heath has harbored feelings for the lady, but he knows exactly why his best friend jilted Emilia years ago, and that secret makes a happily ever after for Heath and Emilia an impossibility. Love demands she follow her heart- Heartbroken after the man she loved ended their betrothal, Lady Emilia Aberdeen, is quite content to live a spinster’s life penning an anonymous column that offers guidance to young ladies. Except, the more she is thrown into Lord Mulgrave’s company, the more she sees that the proper, always-aloof gentleman is also charming, clever, and inconveniently attractive. Emilia discovers maybe it is possible to love again but with secrets between them, Heath will face his greatest challenge yet: loving Emilia Aberdeen or letting her go.